John Owens's recent visit to Moss Lane with the FA XI brought to mind the fact that although John is probably very well known nationally as the England semi-professional sides manager, it is probably less well known that he is one of only five post-war players to have played over 500 senior games for the Robins. Owens started his senior career playing for the British Universities, (eventually captaining them), and it was this connection that brought him to Moss Lane. Roy Rees, who had been heavily involved with the British Universities' side, brought him to Moss Lane from Skelmersdale United in 1972. Initially used as a utility player, due to his pace and good positional sense John soon established himself at centre half. Tall, commanding, quick and an excellent reader of the game, he made a perfect foil for the more traditional type centre half-pairing with Gerry Casey and later Mal Bailey. For 10 seasons, when fit, John was a regular on the team sheet alongside Stan Allan and John Davison, at the heart of the Altrincham defence. He played at Wembley in the FA Trophy win against Leatherhead in 1978 and won two Conference winners medals. He featured in many of Altrincham's famous FA Cup-ties including those against Liverpool, Everton, Blackburn Rovers and Spurs, proving himself to be a key member of probably the most successful Altrincham side in the club's history. When injury finally finished John's career at Moss Lane It was probably inevitable that he would move into coaching or management, as he had became a fully qualified FA Coach in 1978. After spells abroad and later on at Runcorn assisting Barry Whitbread and working as a part-time coach at the Liverpool centre of excellence, John went on to attain national recognition when first appointed manager of the England under-15 national side in 1995. In 1997 he was appointed in charge of the England Semi-Professional side, a post he still holds today and one that has been extremely successful. Last summer John's ability as a coach was further acknowledged when he was appointed Assistant Director at Liverpool F.C. 's Academy. An Alty Legend that we can be truly proud of! Tony Broadhead was signed from Bangor City ready for the start of the 1971/72 season. He was seen, at least initially, as a possible successor to Jackie Swindells who had left at the end of the previous season for Radcliffe Borough. Tony had first come to prominence with Oswestry Town in the mid-sixties as a free-scoring teenager, which prompted his eventually move to Bangor for a fee of £2,000. He scored over 20 goals for Bangor in his first season. This goal-scoring ability soon drew the attention of the Altrincham management who were putting together the beginnings of the side that would go on to dominate non-league soccer for the next decade. Predominately left sided and sure footed with a good shot, Tony's appearance belied both his strength and his pace. He took a while to find his natural position in his first season, playing everywhere from right winger, centre-forward to inside left but still scored 20 goals. For the rest of his time with Altrincham he played predominately as a left winger but remained a consistent goal scorer throughout his time at Moss Lane. Injury dogged his time at Moss Lane but he still managed to pick-up a NorthWest Floodlit League winners' medal in 1972-73 and an NPL finalists' medal in 1973-74. He also featured in Altrincham's 0-0 draw and subsequent 2-0 home defeat against Blackburn Rovers in the second round of the FA Cup in the same season. He returned to Bangor City early in season 1974/75, where he continued to score goals regularly well into the 1980s, becoming one of the most popular and distinguished players to grace Farrer Road. Tony is still to be seen at Farrer Road where he helps out at Bangor in the hospitality lounge on match days. Tommy Banks was special, special that is in that he was one of only a handful of players to have played for Altrincham who was a full England International (the other that springs to mind is Ernie Taylor). "When I first came into the game at Chelsea, Bolton were the team everybody feared for their sheer brute force. Their England full-back Tommy Banks used to say to our winger Peter Brabrook: "If thou tries to get past me today, lad, thou will get gravel rash". He was an outstanding youth player who represented the Boys' Clubs of Great Britain and England. 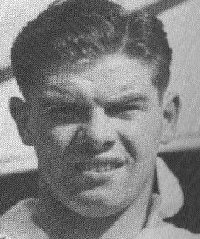 His performances attracted early interest from the likes of Wolves, Manchester United, Leeds United and Portsmouth before he signed on as a junior at Burnden Park. He won his regular first-team place in 1953-54 and retained it until 1960. His career reached its peak in 1958, when he won the first of six full England caps in the run-up to the World Cup Finals in Sweden. In that same year Banks was also the subject of an inquiry from Manchester United, who were rebuilding in the aftermath of the Munich air disaster. However, Bolton had no intention of selling. He won a FA Cup winner's medal in the 1958 final, when Bolton beat Manchester United 2-0. Unfortunately though a series of muscle injuries curtailed his top-class career. In 1961 he joined Altrincham at the same time as another ex-England International (Ernie Taylor) and continued displaying the same whole-hearted commitment in the Cheshire League that had made him an England international with Bolton. After two seasons at Moss Lane Tommy Banks moved on to Bangor City where he continued to impress. Bolton Wanderers 1947/48 to 1960/61, 233 League games (2 League goals), 22 FA Cup games (0 Cup goals). Total 255 games, 2 goals.